The CJF7110.BA0587 TAG Heuer Link Calibre S Chronograph Men’s Watch is a stunning and refined watch featuring the highest degree of engineering and is a worthy piece for any collection. The highlight of the TAG Heuer Link Calibre S Chronograph is its exclusive electro-mechanical movement, which was developed and patented by TAG Heuer. The movement combines mechanical and quartz timekeeping and features a complex structure of 230 components and 5 bidirectional mini-motors. This ensures extremely high precision in the watch’s functions. 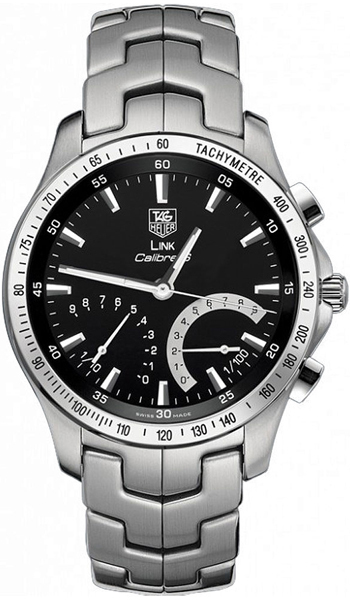 The Link Calibre S Chronograph provides wearers with two operating modes. In Time mode, the half moon dials located at 4:30 and 7:30 serve as a perpetual calendar applicable to 2099. In Chronograph mode, the left dial measures tenths of a second, while the right dial measures hundredths of a second. Chronograph mode also allows wearers to measure simple time, split time, and two periods of time. The dial on the Link Calibre S Chronograph features a monochrome TAG Heuer logo, “LINK – Calibre S” mark, and hand applied luminescent index. The dial also comes in either black or white. The case and bezel are both stainless steel, as is the “S-link” bracelet. The crystal is a scratch resistant sapphire with double-sided, anti-reflective coating on both the inside and outside to ensure dial legibility. It is water resistant up to 300 meters (985 feet).